There were about 100,000 of them when the Spanish arrived in the 16th century. 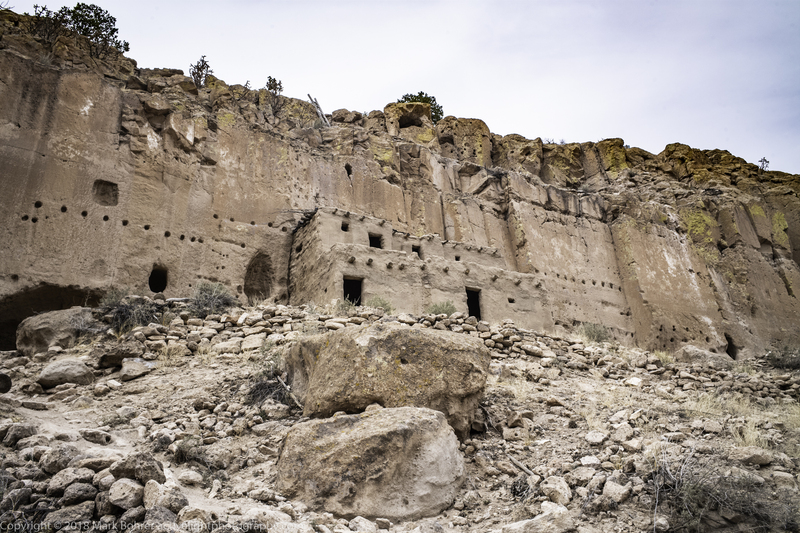 They were scattered among the volcanic cliffs and protected sites along the Rio Grande River, 30 settlements altogether. The Conquistadores, missionaries, and pioneer settlers called them Pueblos, after the Spanish word for towns. After smallpox, years of armed conflict and one major rebellion, just 30,000 Native Americans remain in 21 of those Pueblos, 19 of them along or near the Rio Grande. 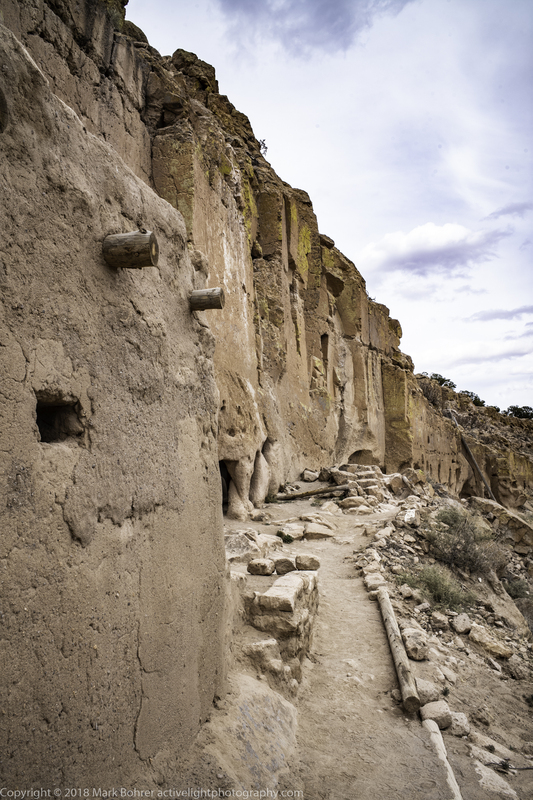 Some of those survivors are descendants of native people from Pueblo towns built in the hardened volcanic ash or tuff of the Jemez volcanic field 1,000 years ago. You can find these towns by looking for the big pimple on a New Mexico map in the northern part of the state. That’s super volcano Valles Caldera, primary source of the ash and debris carried by heavy pyroclastic flows a few million years ago. 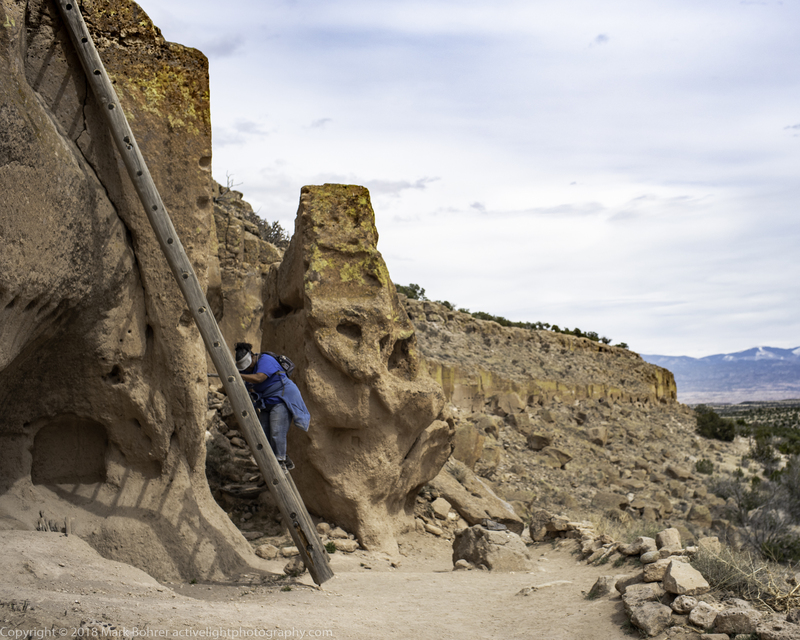 The best known of these towns in the tuff is protected by Bandelier National Monument, where the ancestors of Cochiti Pueblo’s residents once lived. 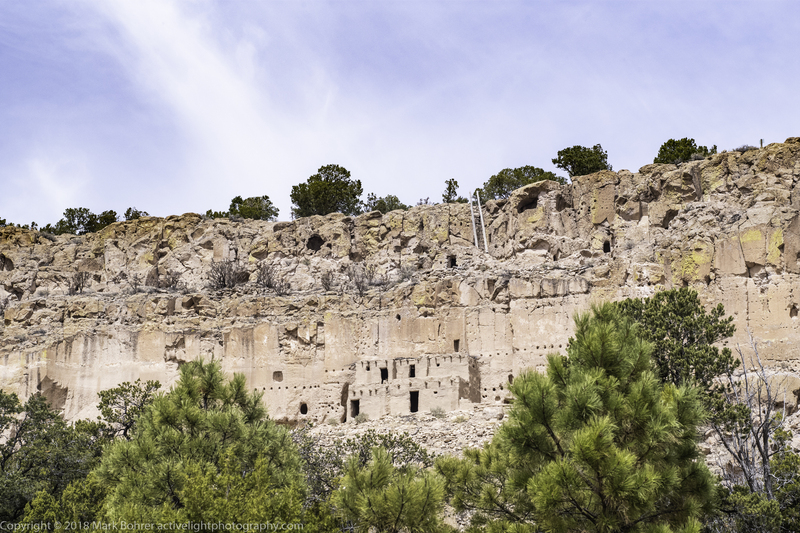 Another is Puye Cliff Dwellings, on Santa Clara Pueblo. The ancestors of the Santa Clarans lived on the high, protected mesa top for hundreds of years, until a drought forced them to move to more reliable water nearer the Rio Grande sometime in the 1400s. Today’s Santa Clara Pueblo remains inhabited on the later site. 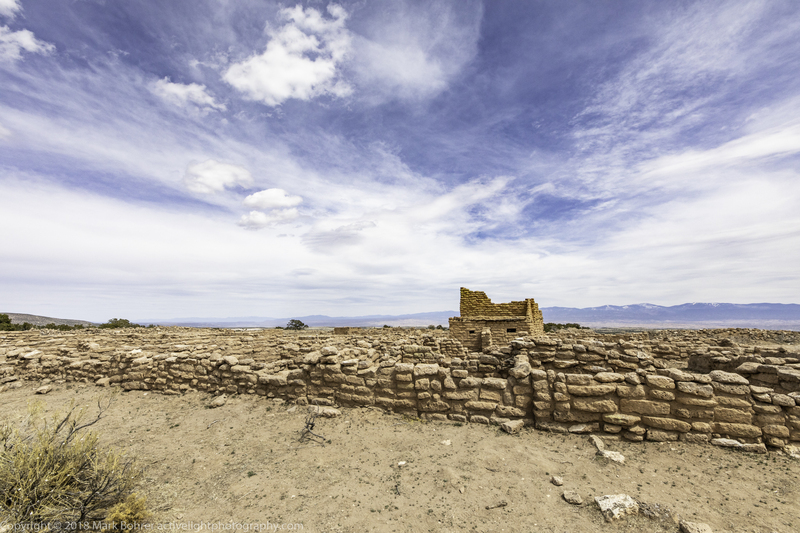 Archaeologist Edgar Lee Hewett worked with Santa Clara and restored half the mesatop pueblo on the original foundations between 1907 and 1910. The other half is only hinted at through its buried foundations. The Santa Clarans forced Hewett out when they discovered he’d been shipping skeletal remains to museums back east. This was completely unexpected for the man who served as the archaeological consultant for the Antiquities Act of 1906, passed to protect areas like Mesa Verde and Chaco Canyon from looting. 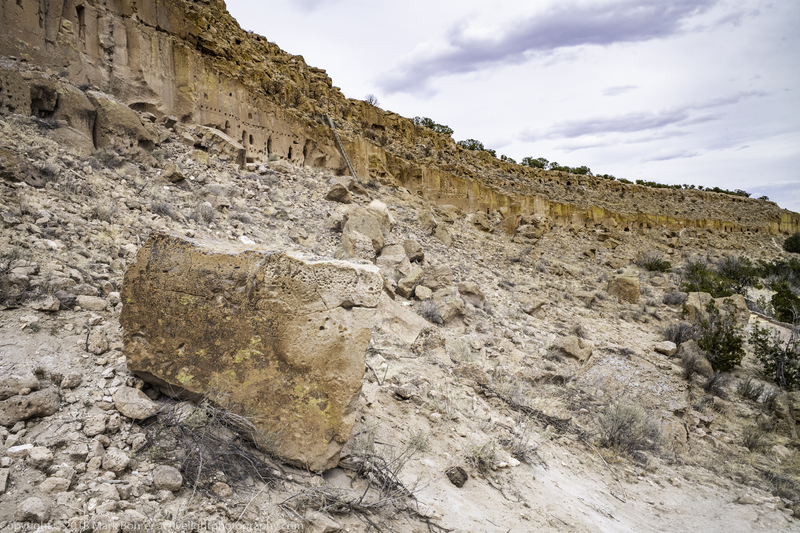 After vandalism from self-guided tours in the 1960s and 1970s, the pueblo now controls access to the mesa with their own guided tours. 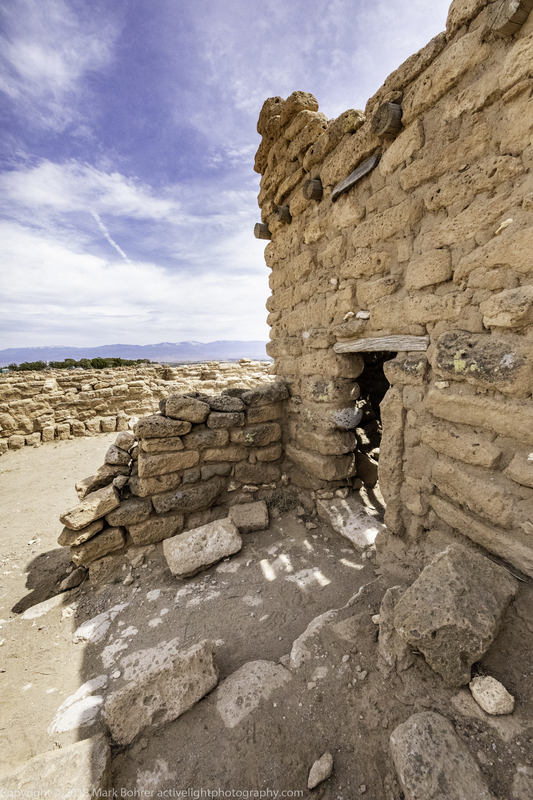 ** Come explore New Mexico’s ruins, petroglyphs and slot canyons (yes, we have those too). Click to discover a photo tour. When we arrived at the Puye visitor center (pronounced Puh-jay), I looked at a very tall ladder leading to the summit and thought, “You gotta be kidding.” But as I would discover, the ladder is less intimidating from the top. Our Pueblo guide drove us to the summit. She was very knowledgeable about Pueblo history and culture, and freely answered everyone’s questions too. I didn’t expect that after what I knew about historic Pueblo reactions to harsh Spanish treatment. You tend to not like people who cut off your feet and forbid the practice of your ancestral religion, while forcing you to produce crops and build cathedrals for them. All of this was done supposedly for the natives’ own good. 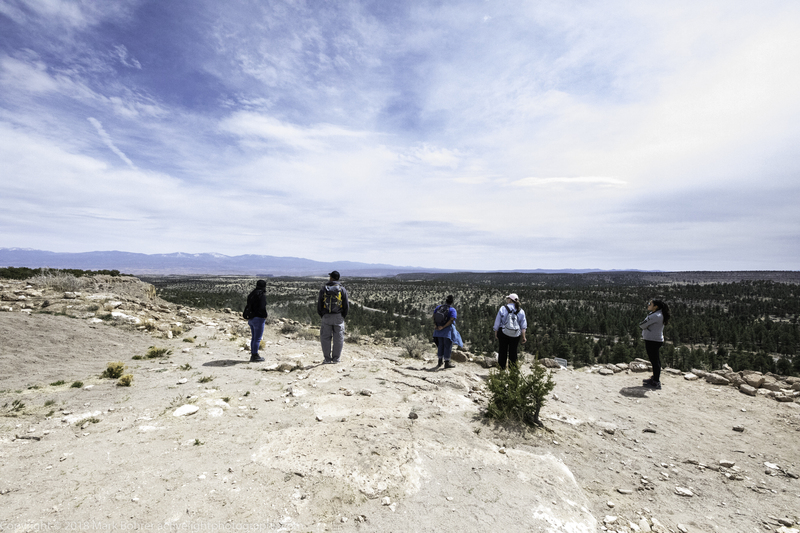 The 360 degree view from the top of the mesa was amazing – south to the Sandia mountains near Albuquerque, northwest to the cinder cones and jumbled peaks of the Jemez Mountains around Valles Caldera, and east to the Sangre De Cristo range extending beyond Taos to the north. 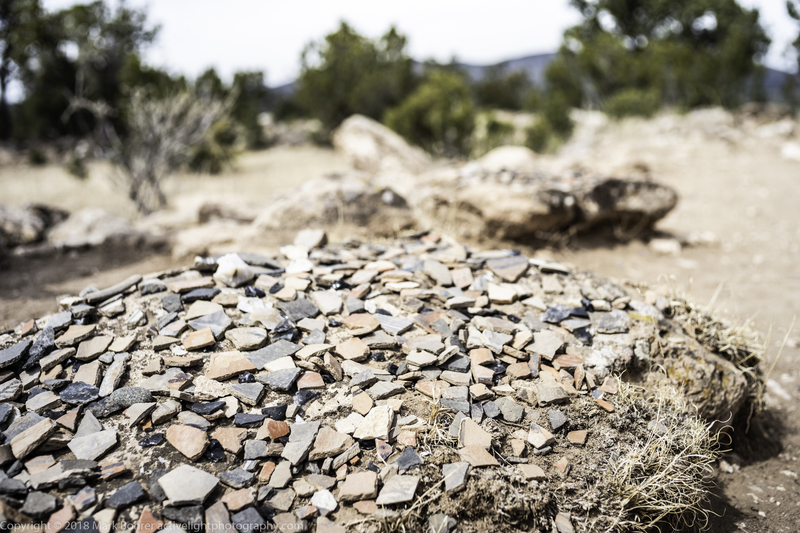 Modern Puebloans have stacked many of Puye’s scattered potsherds in one central location, both to show them to visitors and prevent unintentional looting. Pots were ritually broken when they wore out, or to start a new phase of life. Down the ladder – not so bad! When it was time to head back to the bottom, our guide gave us the choice of a ride down or descending the ladder. We all chose the ladder, since it looked quite sturdy. After we got down, there were several caves and some sandstone brick ruins to explore. Doorways were low, but there was a surprising amount of headroom inside. 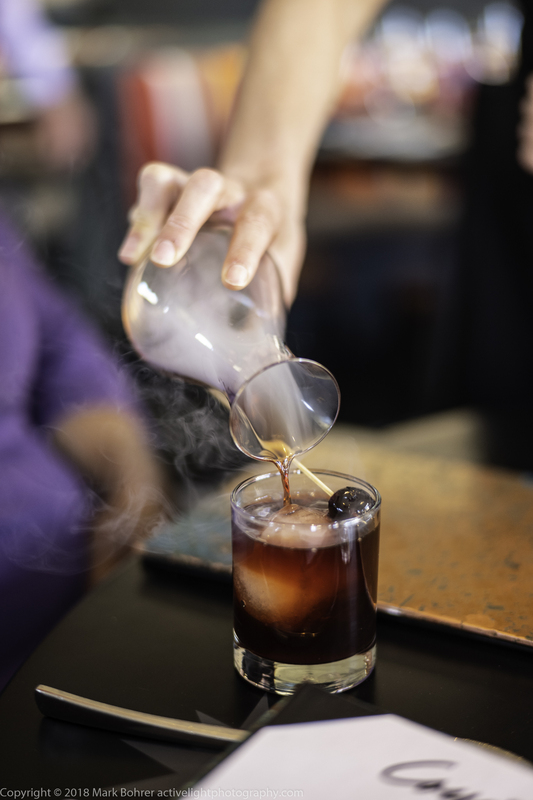 Soot-blackened cave ceilings gave silent testimony to cooking and heating fires in a space used by many people over the years. From there, the trail down wound through rocks and large boulders. I could easily picture ancestral residents successfully defending their mesa-top and cliff-side homes against invaders, a major reason for their location there. We headed to Santa Fe’s Coyote Cafe for a well-earned dinner afterwards. I’m always in favor of modern conveniences wherever possible! I usually leave the EOS dSLRs and lenses at home, choosing the much-lighter Leica M-lenses and compatible cameras instead. But this time I brought the EOS 5D mk IV and Sigma 14mm f/1.8 Art, since I knew I’d be shooting ancient architecture. Most of the time my Leica SL with 35mm f/1.2 Nokton VM II hung over the other shoulder. 14mm and 35mm worked for just about everything. I used a 75mm to capture the smaller scenes with the ladder beforehand, swapping back to the 35mm f/1.2 on the SL. Later I pulled out the M10 with 28mm f/2.8 for an in-between field of view. Juggling three cameras around your neck without self-strangulation is a challenge. The most I usually try to handle is two. That’s plenty when you’re climbing down a three story ladder and ducking into cave dwellings. I carry lenses in a fanny pack, which also protects the M10 if it rains. The selective depth of field with the 35mm lens at f/1.2 or f/1.4 let me isolate subjects from their background in several pictures. I could also do this with the 14mm at f/1.8 close up, but found myself using it stopped down when I needed a big scene completely in focus. I could also have used the 17mm f/4L TS-E for perspective control. This would have allowed shifting the lens up instead of tilting the camera to avoid converging verticals, and giving a different look to pictures. But I didn’t miss it much. It’s hard to bring everything (and carry it all).